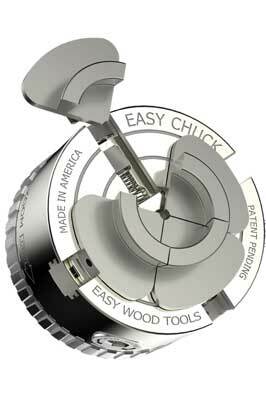 The Easy Chuck has some features not found on any other chuck currently available. The first of these is a 'Zoom Ring' which enables the user to quickly adjust and tighten the jaws by hand before final tightening with the chuck key. The second feature is a quick-release mechanism for the jaws, allowing rapid changeover of jaws using the jaw key provided. A third feature is the rounded shape of the jaw corners, which helps to reduce the risk of injury should your hands come into contact with the chuck when in use. I found the Zoom Ring feature to be particularly useful. It was convenient to be able to hold the workpiece with one hand whilst tightening the ring with the other without having to fiddle about with a chuck key. 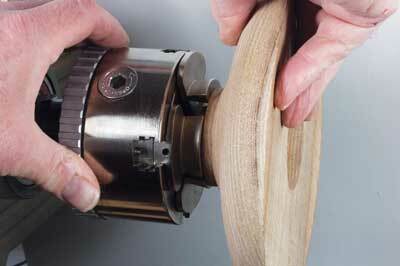 The time saving is not significant but the system is certainly convenient and makes the chuck easy to use. 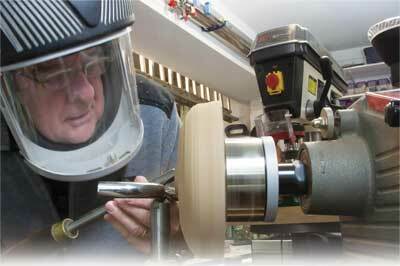 It is of course important to remember to fully tighten the jaws with the key before starting the lathe. The jaw release mechanism is operated by pressing the jaw key into a hole drilled at an angle in the jaw thus releasing the keeper latch and allowing the spring loaded jaws to pop out of the chuck. Replacing the jaws is simply a matter of pressing them into place until the keeper latch clicks into position. This feature allowed me to change a set of jaws much more quickly than is possible even with chucks where the jaws can be wound in and out using the scroll mechanism. 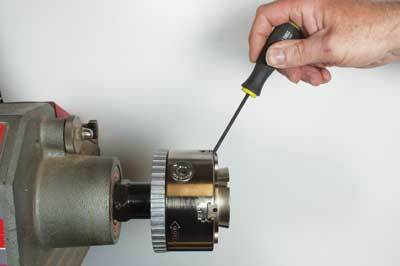 It is certainly quicker and easier than loosening and tightening eight set screws, as is required with many chucks. It is good to see the introduction of features that improve safety and the curved corners of the Easy jaws significantly reduce the risk of serious injury potentially occurring. 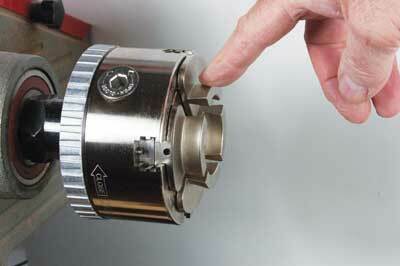 Contacting the moving chuck will still give you a nasty knock but there is much less risk of traumatic injury. Mid-sized at 100mm in diameter, the chuck is available with a 1in 8tpi or 1 1â„4in 8tpi thread and comes supplied with dovetail jaws that expand into a 54mm recess or contract onto a 35mm spigot. Optional extra accessory jaws are available in a range of sizes from 13mm up to 89mm; these also include a useful stepped dovetail jaw set. In use the chuck gripped well in both contraction and expansion modes and performance was comparable with other good quality chucks of a similar size. It ran true and the added convenience of the Zoom Ring and quick change jaws does not seem to come at the expense of operational effectiveness, although in a short term test it is not possible to assess whether the extra moving parts will have any adverse effect on the service life of the tool. At Â£375 this is an expensive chuck for its size and whilst the added features make the chuck easy to use, potential purchasers will no doubt want to balance that convenience against the significant price premium. As a one-off chuck or the start of a chucking system, it is an excellent choice to consider. I was intrigued on hearing about this chuck. The radiused jaw edges, the Zoom Ring and also the quick-release and slide-in-and-click jaw facilities are certainly clever ideas and makes for a very nice operating chuck indeed. The jaws and carrier are cast and machined as one piece and any jaw can go in any key-way without potentially compromising accuracy. The chuck is expensive in comparison to many others, but it is superbly made and the new features, whilst certainly adding to the cost, are excellent additions and genuinely do make life easier. whilst only a long-term test will show how the various parts will wear, this is a very cleverly designed chuck that is likely to cause quite a stir.